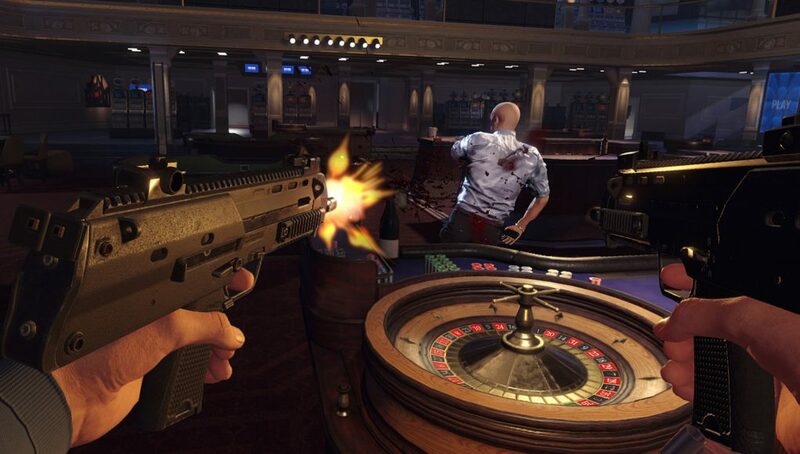 Blood & Truth, a promising VR action shooter from Sony’s first-party London Studio, got a brand new demo for E3 2018 which brings improved gunplay and a new bullet time mechanic while showing off a new level. 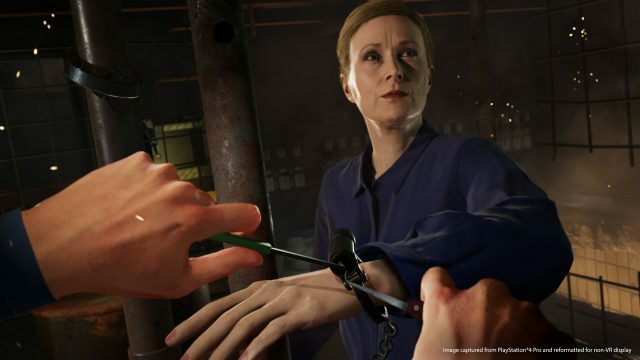 Blood & Truth has grown from the seed of ‘The London Heist’—one of the best recieved mini experiences included in PlayStation VR Worlds—aiming to build upon the many lessons learned and flesh things out into a fully developed game which Sony is saying will bring players five to six hours of immersive gameplay. In my first hands-on with the game back in October, I felt like the game was off to a great start. How are things now seven months later? Still as promising as ever, but the game needs to tread carefully to steer clear of becoming a wave shooter. 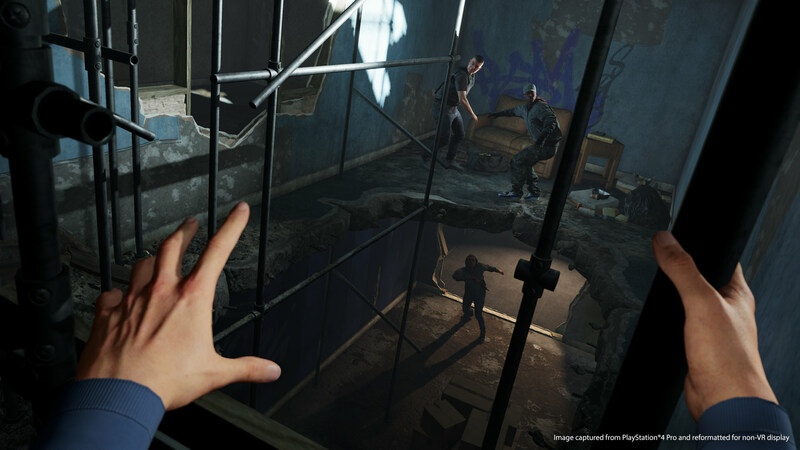 In the latest demo shown off at E3 2018, the game showed refined shooting and weapon handling mechanics. Players now have two holsters near their hips, a chest pack (where magazines are held), and a heavy weapon slot over their back. Much care has gone into making sure these elements are placed in way that they don’t interfere with each other—even in the game’s recommended seated position, it was easy and reliable to holster and unholster my pistol, reload it by pulling a magazine from my chest pack, and holster/unholster the submachine gun on my back. You can now easily hand your gun back and forth between your hands, which makes it easy to switch between hands and get the gun to the desired holster. One bothersome point—while guns use a toggle-hold system (where they ‘stick’ to your hands once you grasp them, even if you let the trigger go), other items in the world use a ‘continuous-hold’ system, where they only stay in your hand as long as you’re holding the trigger. That meant I wound up dropping many of the game’s items, like lock picks and screw drivers, because I was used to the guns using toggle-hold. At one point I dropped an active grenade at my feet for this very reason. It would be nice if grabbing was consistent between all items in the game, whether it be toggle-hold or continuous-hold. Blood & Truth is also now more aware of how you choose to hold your guns. For instance, when I cupped my right hand under my left hand in real life (to stabilize the virtual pistol), my virtual hands animated into a pose to match the act, which felt pretty cool. The SMG slung over my back could also be gripped as a two-handed weapon, though in this case I didn’t like it so much because the two-handed handling was weird, causing the forward hand to have a disproportionate amount of control over the gun’s rotation. I expect this might have been done to prevent the player’s front hand from occluding the rear hand from the PS Camera, or maybe it just needs more refinement to feel good. As before, shooting guns in Blood & Truth feels visceral and satisfying. You can easily spam shots from the hip or blind-fire over cover, or take your time aiming down the sights for some well-placed headshots (especially fun when using the silenced pistol to clear a room without alerting the rest of the compound). On that note, I felt that the scale of the world was a little too small, causing the pistol to look small in my hands, and the holo-scope mounted on top to be a little smaller than I would have hoped. 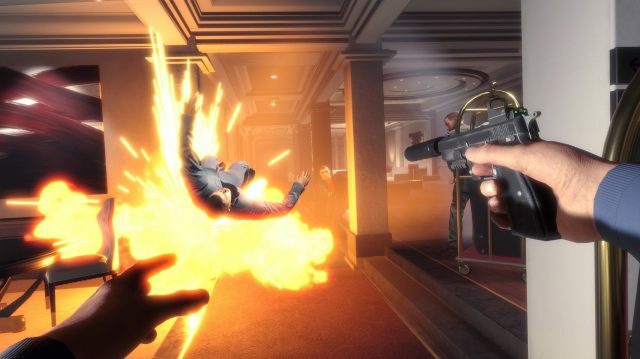 This build of Blood & Truth also introduced a ‘bullet time’ mechanic called Focus. Activated by pressing both Move buttons at the same time, Focus gives you a few seconds of slow motion, providing a good opportunity to dispatch key enemies when you’re in a tough spot. It also looks and sounds super cool—incoming bullets slow down too, giving you time to dodge them with your head, all the while particles and effects can be seen with greater detail. In the prior demo, there was a moment of automatically triggered slow motion, but you couldn’t just activate it on a whim. While your Focus seems to be limited to a certain amount of time (which slowly recharges), I think it might be more interesting to make Focus always available, but make it a risk-reward thing, where incoming bullets do extra damage unless they’re dodged (giving you brief moments of SUPERHOT-like gameplay). Movement is slow and steady to avoid any motion sickness, and while this mechanic feels more immersive than teleportation, it does begin to feel a bit ‘on-rails’. You’ll find moments where you want to go somewhere that seems like you should be able to reach, but you can’t because there’s no node; or times where you’ll want to retreat after pushing too far into dangerous territory, but you can’t because there’s effectively no backtracking between nodes. Being restricted to nodes also kills any sense of exploration (a shame, because the environments look great) and introduces the risk of feeling like a shooting gallery. 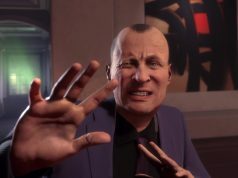 To its credit, Blood & Truth is attempting to head off that shooting gallery feeling before it sets in, by smartly breaking up combat with interactive moments. In the demo I picked the lock on a door (by inserting two tools and carefully twisting them to pop the pins on the lock), disabled a security system (by unscrewing a few screws, flipping a switch, and swapping a fuse), and even used my hands to climb along the outside of a building (by grabbing big bolts in the wall and construction scaffolding to pull myself along). These were all nice distractions from the shooting, but I think these intermission moments need to become more than distractions—they should mean something. 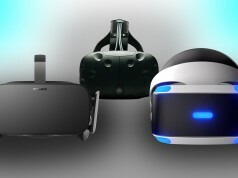 It’s nice to use the 1:1 control of VR to flip some switches and press some buttons, but it should ideally be important somehow, not just a thing you have to do to move forward—and as interesting as the lock picking is at first, I hope I’m not asked to pick 50 locks over the course of the game; there ought to be more variety than that if I’m not even getting to choose which locks to pick (because I’m on rails). One way to fix that may be to sometimes put the player in danger during these intermission moments (like if you don’t get the door open in a certain amount of time, you would get caught and fail the mission). Another could be to give players some sort of choice—perhaps I could choose to pick the lock to a door for a stealthy entry, or choose instead to blow it open with C4 to rush in with guns a’blazing (with the best option being revealed if I have the time to first peek through the window at the type of enemies inside). A combination of these two (danger + choice) could be doubly compelling. I also hope that, beyond the brief intermission moments, chapters of the game will have players doing things altogether different than just shooting—like driving, flying, or even sword fighting! The variety of different vignettes carried along by a meaningful narrative is a big part of what made ‘The London Heist’ great, and Blood & Truth is likely to succeed if it can capture that magic while managing to scale it out into a complete game. The challenge is doing so without becoming a boring shooting gallery, as happened with Bravo Team. We’ll have to wait and see where Sony London Studios takes things next. While we expect that Blood & Truth will launch in 2018, Sony still isn’t confirming a release date or price for the game, though I was told that players can expect around five or six hours of gameplay, split up into chapters meant to run around 20 or 30 minutes each. 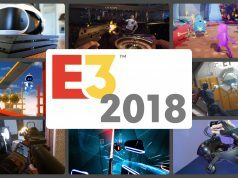 At E3 2018 I also learned that the game is designed for seated play and there’s presently no plans for a ‘standing’ mode. is this one temporal exclusive? It’s made by Sony Studio’s London, so guess if it will ever come to another platform…. LOL, if only that would ever happen, the same with the Uncharted series.. Still pissed they didn’t release the final chapter on the PS3..